In a world of social media and travel shows it’s hard to imagine that any area contains “hidden gems” nowadays. However, there are always a few lurking just off the beaten track, and the Causeway Coast is no different. 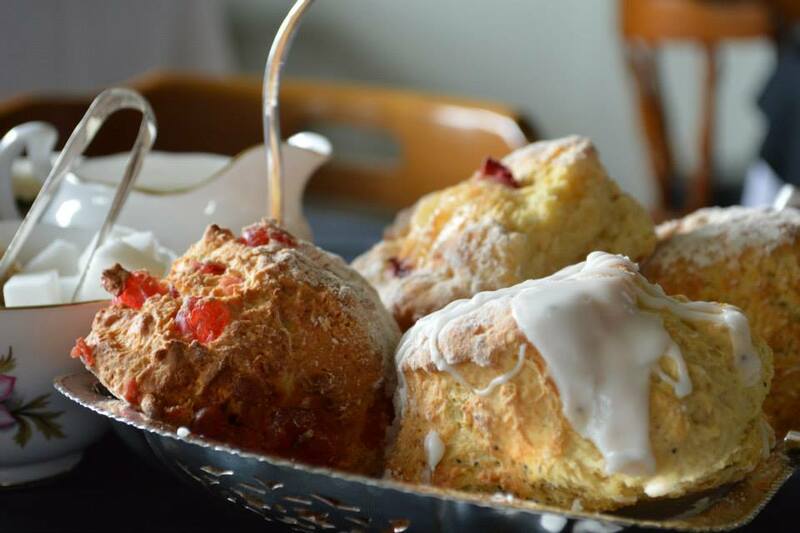 Read on to discover five hidden gems on the Causeway Coastal Route. The Giant’s Causeway, Carrick-a-Rede Rope Bridge, Old Bushmills Distillery and a few others attract the biggest crowds, headlines and photos. But read on and discover another side to the coastal route we love amd call ‘home’. Incredibly, a castle has stood on this site, in the coastal village of Glenarm, since the 13th century. It is the ancestral home of the Earls of Antrim and is still a residence to this day. 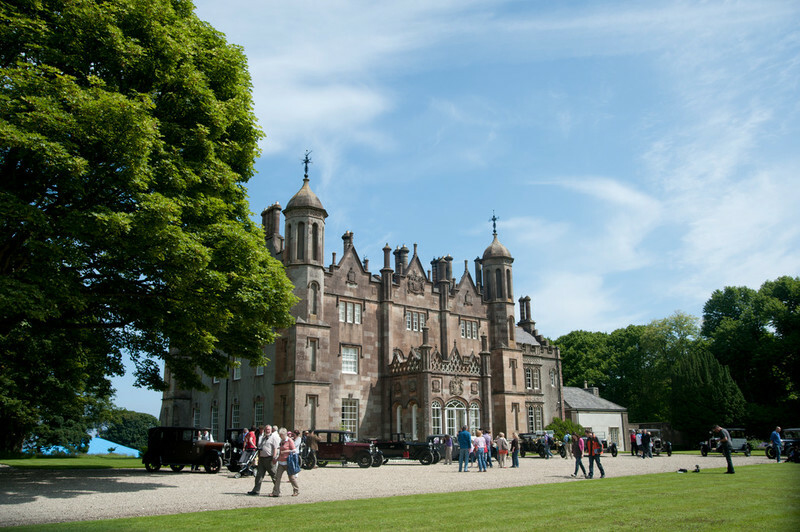 Visitors can enjoy the beautiful Walled Gardens, Tea Rooms and multiple events throughout the year including the likes of the Tulip Festival, Dalriada Festival and Highland Games. 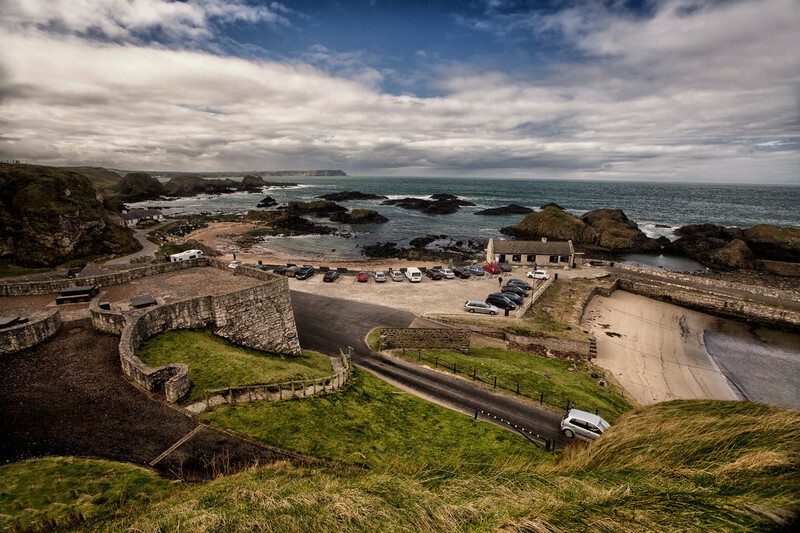 For those in the know Ballintoy Harbour represents one of the absolute best spots along the Causeway Coastal Route. the problem is, if you don’t know it exists, you’ll drive right by it. On a long, winding lane, past a tiny little isolated church, sits Ballintoy Harbour, right on the very edge of Northern Ireland’s north coast. This little harbour and beach is a breathtaking display of rugged beauty. It’s no wonder that Game of Thrones location scouts chose it to feature in the world of Westeros. It might come as a surprise that Mussenden Temple is mentioned in a list of Causeway Coast hidden gems. But consider just how beautiful this iconic attraction is, and how many regular visitors it actually gets. This beautiful temple, originally built as a library, has been dramatically perched 120 feet above the crashing waves below since 1785! 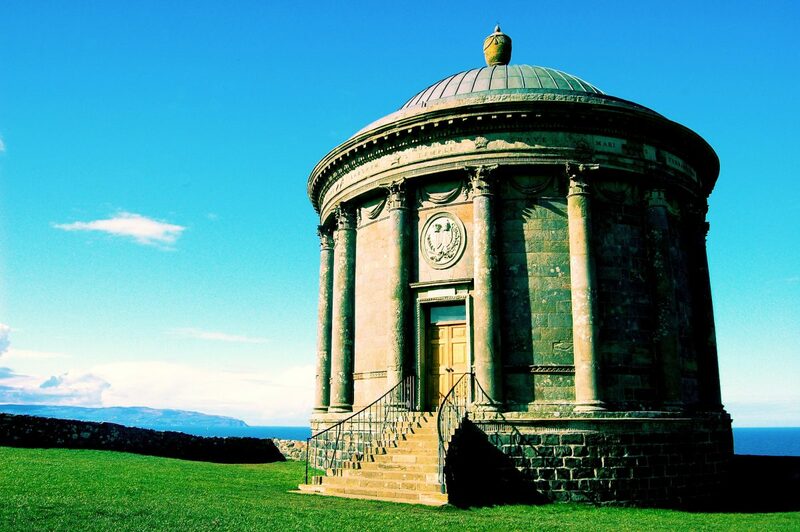 Throw in the idyllic gardens and surroundings of Downhill Demesne, in which Mussenden Temple sits, and you’ve got the making of a wonderful day exploring along the cliff tops. Similar to Ballintoy Harbour, Murlough Bay sits just off the well-beaten tracl. It also offers some of the most beautiful coastal scenes anywhere in Northern Ireland. You’ll find the secluded bay just outside Ballycastle and just beyond the imposing landmark of Fairhead. Whilst it might not be the easiest to get to (as all hidden gems are…) your efforts will be rewarded with beautiful panoramic views, seaside walks and hardly a soul in sight. If you’re looking for solitude along the Causeway Coast this might be the best place for it. Trophy hunters might focus on Royal Portrush and Royal County Down but when it comes to golf, and specifically incredible 1st tees, the Causeway Coastal Route has the answer in the form of Portstewart Golf Club. Enjoy stepping onto the tee and looking onto a breathtaking coastal vista that stretches across the pristine Portstewart Strand. Take in the views, with Mussenden Temple and Donegal in the distance. Agree or disagree with our Causeway Coast hidden gems? Let us know! If you’re ready to explore all our beautiful coastline has to offer then get in touch here if you have any questions or queries about the area. With Christmas and New Years now a distant memory we’re more than ready to turn our attention to the excitement 2018 has yet to bring! As is the same every year, 2018 is fit to burst with events and fun along the Causeway Coast. To inspire and help you organise and plan, we thought we’d collect the best our beautiful north coast has to offer. Please see a complete list of events below. We will update this list as and when more dates and details are confirmed. Easter Sunday will occur on 1st April 2018 this year and Easter Bank Holiday will occur on the following day, Monday 2nd April 2018. For more information on the Causeway Challenge Walk click here. The May Day Bank Holiday will take place on Monday 7th May 2018 this year. The Early Spring Break Bank Holiday will take place on Monday 28th May 2018 this year. For more information on the Vauxhall International North West 200 click here. For more information on the Causeway Coast Ford Fair click here. For more information on the Walk the Glens Festival click here. For more information on the Salmon and Whiskey Festival click here. For more information on the Causeway Coast Amateur Golf Tournament click here. For more information on the NI Super Cup, formerly known as the Milk Cup, click here. For more information on the Portstewart Red Sails Festival click here. For more information on the Armoy Road Races click here. For more information on the Causeway Coast Mini Club Weekend click here. For more information on the North West Pipe Band Competition click here. 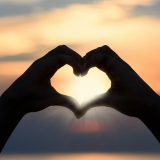 For more information on the Cushendall Heart of the Glens Festival click here. For more information on the Auld Lammas Fair click here. For more information on the Northern Ireland International Airshow / Air Waves Portrush click here. For more information on the Great Northern Links Challenge click here. For more information on the Giant’s Causeway Coast Sportive click here. For more information on the Portrush Beer Festival click here. The Causeway Coast always turns into a spooky, scary place every October and 2018 will be no different! Stay tuned for more. 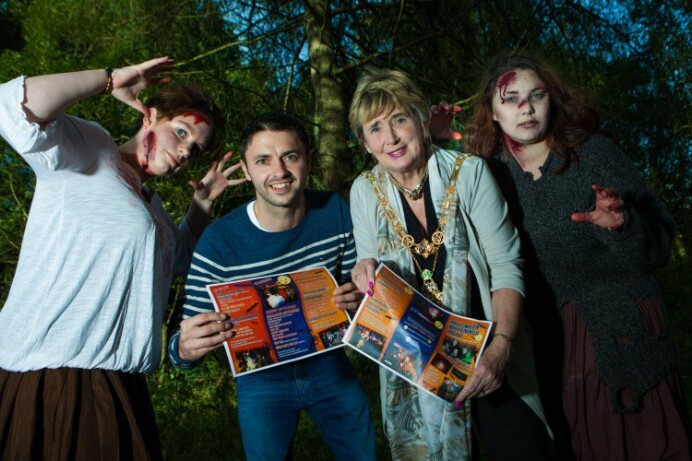 For more information on the Ghosts in the Glens Storytelling Festival click here. For more information on the Atlantic Sessions click here. It might seem like an age away right now but we all know that Christmas creeps up faster and faster every year. Keep an eye on our website and social media channels for more information on events the closer it gets. Safe to say it’s a pretty impressive list, right? Which event is a must see or do for you? Let us know on Facebook, Twitter or Instagram! For all other enquiries, including rooms and rates for any of the dates and events listed above, you can get in touch with our team by clicking here or by phoning 028 7082 3507. If you’re planning a break to Portrush this summer and enjoy live entertainment, we have lots of options in the coming months. From Irish country, easy listening, classic rock to chart covers, Gareth, Tom and Jason have something for everyone! 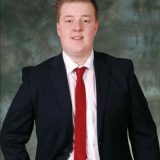 Gareth made early appearances on stage at his school in Castlederg and has grown not only in stature but musicality ability in the years since. He plays in many venues across the north west and is able to entertain young and old alike. Do you know your IPAs from your saisons? Your stouts from your sours? Chances are you might do, or are eager and ready to start learning! Either way, the upcoming Portrush Beer & Food Festival is the perfect way to experience some quality craft beers, whiskeys and food from a variety of specialist providers all within the four handy walls of Portrush Town Hall. The event, organised by our friends at the Lacada Co-operative Brewery here in Portrush, will take place between Friday 6th and Sunday 8th October starting at various times each day but finishing at 10pm each night. Whilst there you’ll be able to enjoy the exploits of the likes of Lacada, Beavertown, Glens of Antrim Ales, Yellow Belly, Kraken Rum, Bushmills Whiskey and more! Festival goers will also be able to take in the delightful tastes of Babushka Café, Broughgammon Farm, Causeway Catering and Naturally North Coast and Glens Market who will all be providing delicious food to pair with your drinks. You can find out more about the event on the official website by clicking here. If you’re interested in finding out more about our local brewing friends Lacada then click here for our interview with their head brewer! We all know that craft beers can pack a pretty big punch so please be extremely careful, drink responsibly and always have a designated driver if you’re travelling far. If you would like to soak up the sights, sounds and charms of our incredible Causeway Coast during the festival then get in touch with our team for room rates by clicking here. The summer might be drawing to a close (always disappointing even if it’s expected) but the autumn months bring new events and excitement to the Causeway Coast, not least this year, the World Surf Kayak Championships in 2017! In October, 20th to 28th, Portrush’ East Strand beach will welcome up to 150 competitors and it’s easy to see why the competition choose our backyard as the location for this years event. The East Strand, set along the breathtaking Causeway Coastal Route, which was recently featured on BBC One’s The One Show, offers approximately 2.5 miles of glorious beach front and crashing waves. Competitors from as far flung as Australia, USA, Japan, Costa Rica and countless other European nations, will battle it out on the hard swells of the Atlantic Ocean for Best Team and Best Individual Championships and crowds are guaranteed exciting viewing and big air moves! The event, organised by the Canoe Association of Northern Ireland, will be free to spectators and will also include local boys Johnny Bingham and Andy McClelland competing for top prizes. 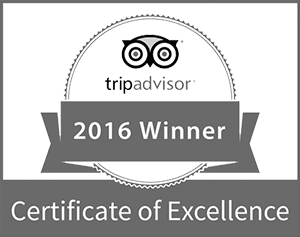 If you plan to visit Portrush during the Championships, to participate, support or just enjoy the fun, we’d be happy to accommodate you. You’ll get a classic Causeway Coast welcome, a week of craic, and plenty of hospitality (should you require it…). For more information simply call 028 7082 3507 or click here to get in touch with our team. Looking forward to seeing all the competitors in action! 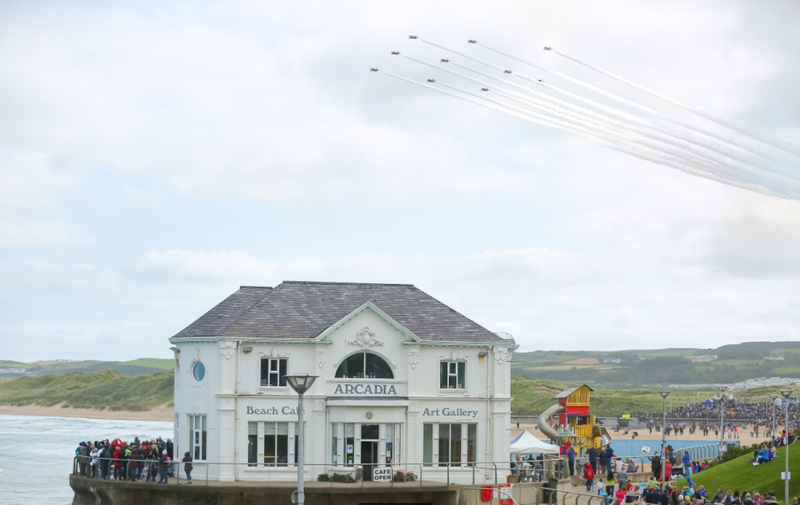 The Portrush Airshow, alongside many other annual events on the Causeway Coast, has become a staple in our calendar and something we look forward to every year! It’s not hard to see why the Airshow is one of Northern Ireland’s most popular events. Set on the spectacular backdrop of the Causeway Coast, on Portrush’s East Strand, you’ll see the incredible RAF Red Arrows, RAF Battle of Britain Memorial Flight and the Mig 15 amongst other airplanes and aircraft. Alongside that we’ll also see Helicopter displays, the Irish coastguard, the Motor Village and Star Wars characters all coming to town. Finally, we’re especially looking forward to wandering around the Naturally North Coast and Glens Artisan Market. If you’re coming to the Airshow you have to make sure to stop by because some of the foods (and smells) are so heavenly! If you want to make it a long weekend where you enjoy the show, the beautiful coastline and (most importantly) the craic, without having to rush home afterwards, then check out our rooms and rates here. For any other questions, about the Airshow or otherwise, you can contact us here! Ask anyone in Northern Ireland and they all seem to say the same thing: the Causeway Coast is the place to be! 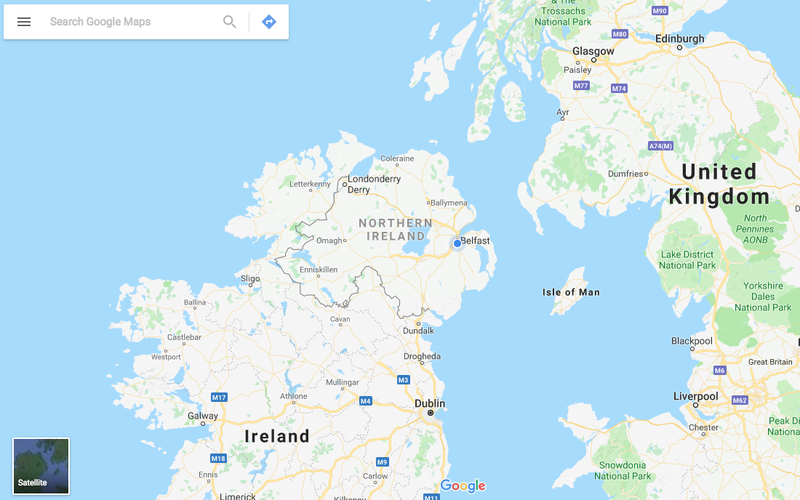 Sure the Mourne Mountains are beautiful, the Fermanagh Lakelands enchanting and the cities buzzing but the Causeway Coast seems to pack all of this into one small corner of the country. Lucky for us! We’ve taken a look at different parts of the coast before (like the Game of Thrones locations) but today we thought we’d focus on truly coastal experiences. That means lots of water, lots of walking and incredible views! 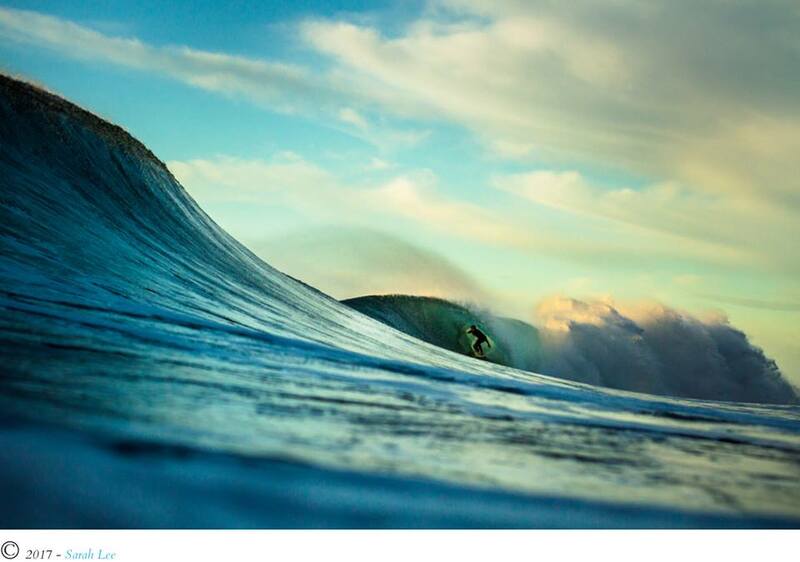 How about a spot of surfing? There’s nothing better than getting out into the water and looking back at the incredible north coast and our Portrush partners in crime, Alive Surf School, offer up the best surfing options available! Whether you’re a first timer, an expert, a group of young guns or some silver surfers, Alive will welcome you with open arms and give you a proper coastal experience! Who wants to use our gloriously rugged coastline as their very own adventure playground? 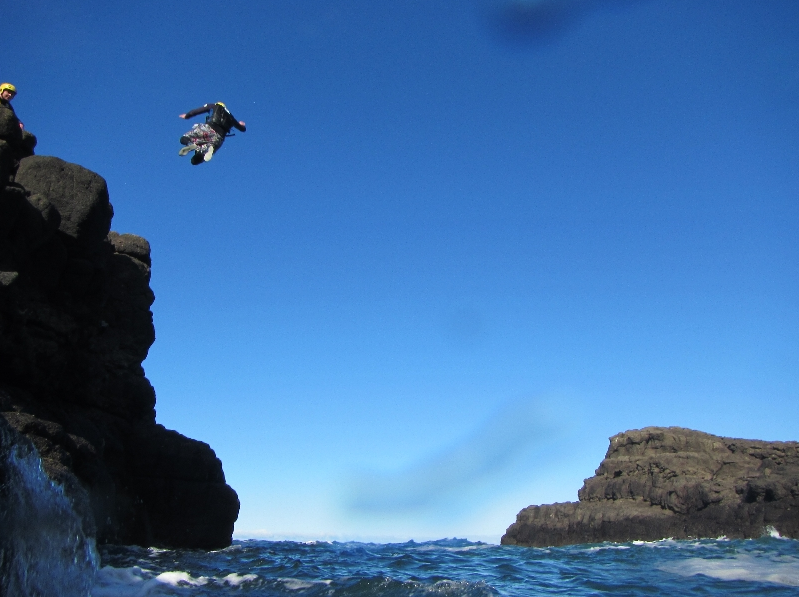 Well, that’s what the guys and gals of Causeway Coasteering are promising if and when you join them for some fun. Alongside experienced professionals you’ll be able to dive, belly flop and bomb into the water after clambering all over the rocks to get to the best spots! The team over at Aquaholics will take you out on boat trips and sea safaris so you can enjoy the spectacular coastline and wildlife we can all, way too easily, take for granted at times. If you’re feeling especially brave then you can don a wetsuit and dive right in! If you’re not a true “water baby” but still want to enjoy the incredible scenery the Causeway Coast has to offer we would highly recommend checking out Away a Wee Walk. Eimear Flanagan offers uniquely personal tours that take away the hassle of figuring out the “who, what, where, why and how”. All you have to do is turn up, follow the leader and set about enjoying the sights and sounds of the Giant’s Causweway, Murlough Bay, Fairhead and beyond. Causeway Cycle Adventures offers a similarly great way to explore and enjoy the Causeway Coast. They offer electric bike tours, lead by experienced locals, that give you a proper insight into the sights, sounds, experiences and attractions of our local coastline. Don’t worry if you’re not the most experienced of cyclists. The electric bikes will give you that little bit of extra power when it’s most needed! If any of that sounds good (and how could it not?!) then let us know! We’d be happy to help, or point you in the right direction, so contact us by clicking here for more information.